I just waded through a 32 page academic study on the effectiveness of using the "Buy It Now" feature on eBay. I dug out some golden nuggets from this dry and lengthy report so you won't have to. It really opened my eyes. Let me share what I discovered. A hot topic in the eBay community seems to always be the latest increase in eBay listing fees. After all, profit is what you keep after you pay all expenses. Listing fees are one of them. So is it worth it to use the "buy it now" feature? 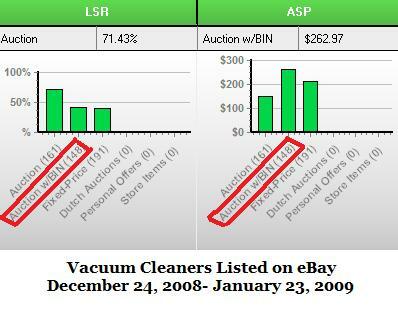 It really depends on the product, as I found, using HammerTap auction research tool. For many products, it yielded fantastic results. Let's quickly discuss a few of the issues that make some auctions perform much better using eBay's "buy it now" option. We're all pressed for time. This applies to purchasing online. Sometimes we simply don't have the time to watch an auction. We have other things to do. Other times, we don't just need a product, we need it right now. Last week my washing machine died. As a guy, I probably could have gotten by for a couple of weeks without it. My wife didn't see it that way. Needless to say, within a few days we had a working washing machine. It just couldn't wait. Some products are like that. "Convenience" items like washing machines, microwave ovens, and televisions get replaced quickly when they break down. If you lose your cell phone, you'll probably have a new one within days. When you shop on eBay for a product you feel you need right away, you may not have several days to wait. At those times, "buy it now" can be your friend. You'll probably pay more by using the feature, but you may not have a choice. In fact, for many products I researched with HammerTap, that's just what I found. You often pay more... sometimes a lot more. Let's look at a couple of examples that illustrate the point. Looking at the graph above, it looks like I'm not the only one willing to pay more to have a washing machine right away. 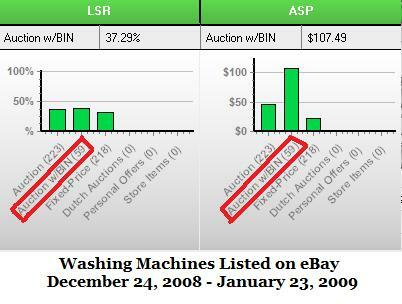 Those who bought a washing machine paid quite a bit more when they used the "buy it now" (BIN) feature. However, notice that they actually only slightly increased their chances to sell by using the BIN feature. It wasn't much of an increase, but at least we can definitely say that for washing machines, you're not necessarily more likely to sell using the BIN feature. How about other examples of products one might need in a hurry. My family is cursed with an ability to kill vacuum cleaners a couple of times a year. When they break, we replace them right away to keep our home looking nice. Let's take a look and see what we find. This looks similar to what we found for washing machines. Using HammerTap auction research tool, I also found similar trends for car parts and microwave ovens. For some things, when you need them, you need them soon. The buy it now option helps you get what you want sooner. Using Buy It Now puts a cap on how high the auction bidding can go. You may cheat yourself out of profits. Auctions with BIN feature may not feel as urgent, giving buyers the impression they can buy anytime. You may get fewer bids, which often means a lower selling price. For some products I researched, setting a buy it now price actually resulted in less chance to sell your product. For some categories, products actually sold for less with the BIN feature. As with so many aspects of a successful auction, there is no firm and fast rule which applies to all product categories. An auction research tool like HammerTap helps you consistently know whether you'll make more on your eBay listings by using a buy it now price. Note: Looking for products to sell online? Check out Doba for thousands of potential products, and use HammerTap to research how they will sell.